POWER DOWN. LIVE IT UP. HOW A WILD RIVER TAUGHT TROOP 223 THE VALUE OF CLEARING ITS AGENDA FOR ADVENTURE. ASSISTANT SCOUTMASTER MICHAEL BROWN was two steps away from freedom. Step one was easy. Kneeling on the banks of the Rogue River, Brown unhooked his Rolex Submariner, glanced at the dial one last time, and carefully tucked the watch deep inside his teal dry bag. And step two? Well, many adults find it difficult parting with their iPhones for almost a week. But Brown would especially miss his. As the CEO of a California coffee company, his job requires him to monitor worldwide shipments and remain in almost constant communication with his customers and colleagues. Guide Eli Helvey helps steer the raft and gives the guys on-the-fly paddling lessons. Which is why Brown spent a long moment staring at the screen when the time came to power down his mobile device and place it next to the watch in his bag. No more constantly checking the time. No more answering e-mails. Just a single item would occupy the assistant Scoutmaster’s normally jam-packed schedule for the next five days: a 40-mile rafting trip down the rugged Rogue River in southwest Oregon. With 11 Scouts and Scouters from Los Angeles-based Troop 223, Brown was leaving behind a life that’s measured in 30-minute blocks on a calendar for one measured only in miles and memories. Welcome to release from the ticking clock and the buzzing smartphone. Welcome to a world where the schedule ebbs and flows not around the next meeting but around the next bend. On that first morning, Troop 223′s Scouts and Scouters made their way down a hill from the Galice Resort in Merlin, Ore., a charming, riverside retreat where they had bunked in rustic comfort the night before. Each of them carried two dry bags stuffed with everything they’d need for the coming week—and a few things they wouldn’t. Somewhere near the bottom of the bags were cell phones, MP3 players, and game systems—superfluous devices when you’re living on River Time. The group gathered at the put-in point, a slow-moving stretch of the Rogue, where the trip’s hired guides had been preparing for at least an hour. The rafts—one 14-foot paddle raft and three 16-foot, oar-powered gear boats—were loaded with everything but the guys’ personal gear. As a Class III river, the Rogue features opportunities for a passenger to fall out around every turn, so safety gear is a must. Before shoving off on the first day, guide Roberto Carrera helps check Alex Brown’s helmet and personal flotation device for a proper fit. Helvey advised that when Scouts needed a break from paddling, they should keep both hands on the paddle. Failure to do so, he explained, could result in someone going home with “Summer Teeth”—river slang for where a rafter’s teeth might land after taking an errant paddle to the mouth. Helvey’s joke concealed an important safety lesson—a tactic that seasoned Scouters use all the time. The veteran guide next told the boys how to rescue someone who had taken an unintentional plunge into the water. Helvey cautioned not to pull him up by anything that’s part of the body: arms, legs, hair. Instead, they should lift him using his lifejacket. “If that rips, it’s easy to sew back together. Sewing on an arm? That requires equipment you don’t have,” he said, drawing another laugh. Next, Helvey promised that after their first day on the river, they’d have an opportunity to test their skills in the inflatable kayaks known as “Duckies,” so named because their yellow color and rounded shape suggests rubber ducks that float in a bathtub. Before launch, Helvey and his team of three guides checked that everyone had securely fastened their PFDs and locked their helmets in position. Only then were the Scouts allowed to step into the paddle raft, each of them grabbing a red-and-yellow paddle and taking a seat along the edge of the craft. The guides split the adults into three groups that boarded the larger boats, where they simply rode while the guides worked the oars. A daily rotation schedule ensured the opportunity to experience the paddle raft, where the Scouts—most making their first rafting trip—began a hands-on education in river physics. First lesson: Three paddlers working together on each side of the raft works better than six individual, out-of-sync paddlers. After just over a mile, the guys got the hang of paddling and navigating, and by then the headman was ready to reward their efforts. You won’t find dramatic waterfalls on the Rogue River itself, but ice-cold creeks serve as small tributaries and provide spectacular views. 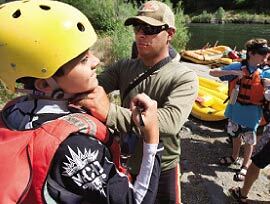 Even without stomach-churning drops, though, OARS guides and Troop 223 Scouters preach safety to the Scouts. “Who’s hungry?” Helvey asked. 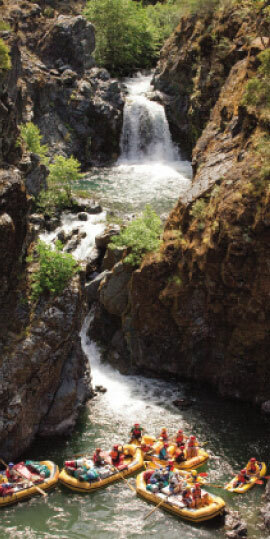 Several hands shot up, and he directed the rafts to beach at a shady spot below a large concrete bridge that marked the end of civilization and the beginning of the Rogue’s Wild and Scenic section. Lunch consisted of a savory pulled-pork sandwich on pita flatbread. Helvey told them that this was his favorite meal of the trip. But then, he used that description every time they ate. Brown then staged a rock-skipping demonstration, using a wide, calm section of the river. The assistant Scoutmaster consistently skipped low, straight shots that seemed to float across the water and dip under the surface 10 or 15 times before reaching the bank on the far side. “Whoa!” echoed the guys. Understandable, since most of their first attempts sunk like, well, rocks. They didn’t give up, though, and soon settled into a groove. Skipping rocks didn’t result in skipping any valuable time, though—a telling illustration of the allure of River Time. They were in no hurry to get to the day’s final destination because campsite options were plentiful. And the setting sun, not the senior patrol leader, signaled lights out each night. Mornings, the guides didn’t rush to serve breakfast at “6 a.m. sharp.” They served it whenever the coffee was ready. Even Troop 223′s pre-trip planning had been a breeze. Departing from their usual procedures, older Scouts, under the guidance of adult leaders, arranged the trip through OARS, a national river-rafting outfitter. OARS provides everything: the guides, the boats, the supplies, the food, and the activities. All the guys had to do was pay their share and show up. Still, River Time meant only a refreshing escape from stress—not from camp chores. OARS provided the supplies and cooked the food, but the leaders expected the Scouts to paddle, unload rafts, and set up their sleeping area. Using an outfitter, they said, just let the young guys enjoy the experience of rafting the Rogue without piling too many tasks on them. Helvey defined “downstream V” as the arrow shape that water makes when it flows between two objects, pointing to the fastest and safest route through a rapid. And he promised to point out other river features, like strainers and eddies, as they made their way farther down the Rogue the next day. Class IIIs suited the Scouts just fine. 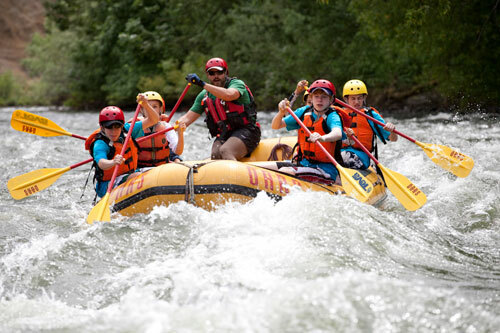 They had built confidence in the rafts on their first day and were ready for a tougher test—a perfect challenge for a group with little rafting experience. “O.K., this is it!” Helvey shouted as the first set of rapids approached. Paddles were held at the ready as the Scouts’ backs straightened. Each wave brought a wall of water into the boat, and the biggest ones drew a “Yes!” from the guys. The chilled water soaking into clothes only seemed to inspire everyone to paddle harder. After sloshing through three hours of tricky Class IIIs, the guys were ready to call it a day. Running the rapids had put them in good spirits, initially, until they faced the task of unloading the rafts. They were more than willing to help move the dry bags from the boats to the campsite but disagreed about the most effective way to handle the chore. Adult leaders and the river guides suggested they form a fire line: stand within arm’s reach and pass the bags along from the boats to the camp area. No way, said 13-year-old Otis Jones. He argued that each individual find his personal bag and haul it to his own area. That way, each bag would be handled only once. 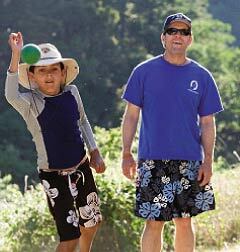 As father-son bonding activities go, it’s hard to beat a game of boccie on a sunny day. Just ask assistant Scoutmaster Michael Brown, as he watches his son, Alex, take aim. As flames blazed in the fire pit on the group’s final night on the Rogue, the boys and adults engaged in the time-honored tradition of sharing their favorite memories of the trip. 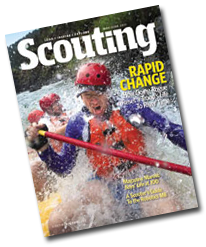 Eagle Scout Bryan Wendell is Scouting magazine’s senior editor. Guide Eli Helvey’s quesadilla pie, or “Eli Pie,” (being enjoyed below), was a hit. Here’s how to make it. You’ll need a 12-inch Dutch oven, two pounds chicken meat, chili powder, 2 bell peppers, 1 yellow/white onion, 1 large can red or green enchilada sauce, 12 corn tortillas, 2 tsp. minced garlic, 1 can beans, 8 oz. shredded cheese, and 1 package corn-bread mix (to which you’ll add milk and eggs). Boil chicken until cooked. Shred cooked chicken with a fork and add a pinch of chili powder. Mix well. Cut all veggies thin and lightly cook. Layer everything in the Dutch oven like a lasagna. Use this order: enchilada sauce, tortillas, chicken, veggies and garlic, beans, and cheese. Repeat for two or three layers. Top with the corn-bread batter, leaving enough room for the corn bread to rise. Preheat the lid with 16 coals. Once the lid is hot, spread 10 coals on a fire pan, and place the Dutch oven on top. Leave for 45 minutes to an hour or until the corn bread is golden brown. You’ll be able to smell when it’s done. Serve with salsa and sour cream. Feeds six.